The Auto category on the web is having an amazing run! This week Mahindra launched its new SUV - XUV500. I have been following this campaign for some time now. What is interesting about this campaign on the web is that they’ve ensured a sustained interest with a multi-pronged roll-out. It all started with a Teaser where the website featured sneak peek videos and teaser ad with the car under wraps and a ‘Guess the Price’ Contest – the gratification for which was a spanking new XUV500. They followed it up with a Live Webcast of the launch on 28th September. It was powered by 24 Frames Digital and whatever I caught of the webcast, the stream was smooth and well executed. Post launch, the site has morphed into this slick and visually appealing experience zone, which offers the user every bit of information that he could possibly seek about the car and the regular auto website staples, ranging from videos, galleries, downloads, 360 views, feature sets & specifications, dealer locators etc. Reviews, online communities and some other bits are coming soon and we will surely keep an eye out! 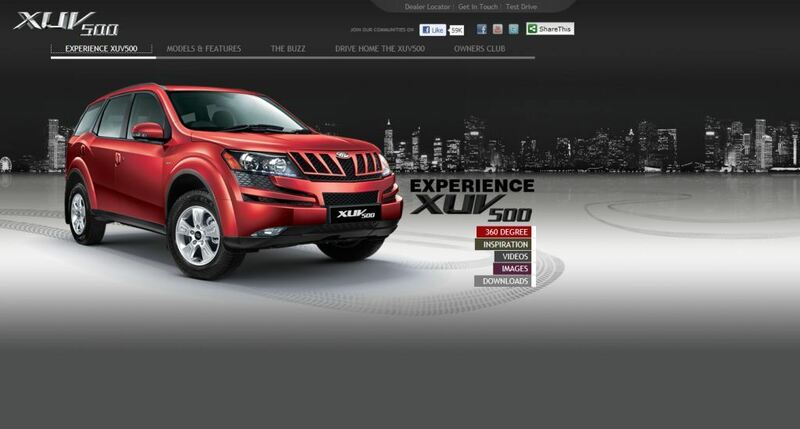 Yesterday, I caught a tweet from Anand Mahindra, agreeing with a user feedback, about the XUV500 site not rendering well on an I-pad. Hmmmm. Mahindra XUV500 has given huge success and added a brand value to it.Now people has blind trust in its vehicle's power and performance.XUV500 is inspired from Cheetah.